This article was previously published by the author in August 2017. In D&C 88:63 the Lord extends four invitations coupled with four amazing promises. He invites us to draw near to Him, to seek Him diligently, to ask, and to knock. 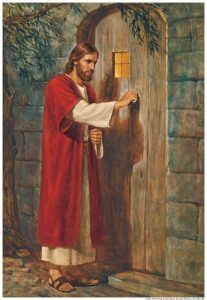 In return for our faithful response to His invitations, He promises that He will draw near unto us, that He will be found by us, that as we ask He will answer, and as we knock, He will open up to us. The Lord’s invitations solicit four questions. How do we draw near unto Him? Where and how do we diligently seek Him? What should we ask Him? What does it mean to knock and how do we go about it? This is the first in a series of four articles written to answer each of those four questions. How then do we draw near unto God, and in reality, unto God and Christ for we know that they are one in purpose and have the same ultimate goals? There are multiple ways, but for the purposes of this article I will focus on just three. First, we can draw near unto God through prayer. He is our loving Father. He knows us intimately and wants to be close to us. He is ever ready to listen to us if we will but take the time to call upon Him. 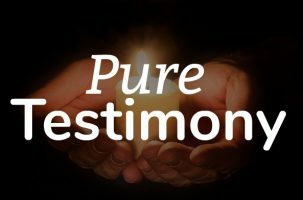 He has promised that He will answer in His own way, in His own time, if we ask in faith, “with a sincere heart, with real intent,” (Moroni 10:4) having a determination to act upon the answer He gives us. Notice that first we ask, then we act. As we go forward with faith and act in accordance with God’s answer, we will feel peace and feel His direction in our lives. Second, we can draw near unto God by studying the scriptures and applying God’s and Christ’s teachings found therein in our lives. Jesus taught, “And this is life eternal, that they might know thee the only true God, and Jesus Christ, whom thou hast sent” (John 17:3). Nephi invited us to “feast upon the words of Christ” (2 Nephi 31:20) and taught that the “words of Christ will tell you all things what ye should do,” (2 Nephi 32:3). As we feast upon Christ’s words, we will come to know Him and God, and come to know those things they would have us do. As we do the things they would have us do—following Jesus’ counsel when He taught “… If a man love me, he will keep my words”—we will reap the promised blessing: “… my Father will love him, and we will come unto him, and make our abode with him” (John 14:23). Third, we can draw near unto God through service. King Benjamin shared this marvelous counsel: “…when ye are in the service of your fellow beings ye are only in the service of your God” (Mosiah 2:17). Christ is our perfect example of service. All that He did was in fulfillment of His overarching goal to do those things which pleased His Father, even God. What was it that pleased Father? Every effort to help Him, God, to reach His overarching goal, “to bring to pass the immortality and eternal life of man” (Moses 1:39). You and I can do the same. As we follow the Savior’s example, having an eye single go God’s glory (bringing to pass the immortality and eternal life of man), forgetting ourselves and going to work in an effort to make a difference for good in the lives of those around us, the promise is that we will find ourselves and we will be filled with love. 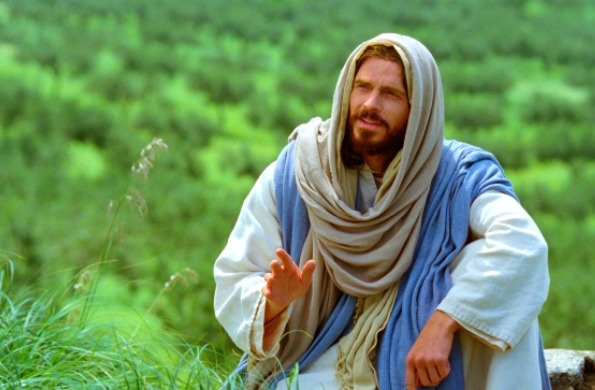 We will be like the Savior, exerting a similar influence such that others will want to know Him because they know us. As we do these things, we will draw closer and closer to God and “always rejoice, and be filled with the love of God, and always retain a remission of [our] sins; and…grow in the knowledge of the glory of him that created [us], or in the knowledge of that which is just and true” (Mosiah 4:12). For myself, I know that these things are true. I know through prayer and by the power of the Holy Ghost that God is there. I have felt Him draw closer to me as I’ve prayed in sincerity and then acted in faith on the answers given. As I have feasted upon the words of Christ, following Nephi’s counsel, I have experienced for myself the powerful effect of God’s word on my heart, mind, and soul, as described by Alma (Alma 31:5). Through the scriptures and their application I have a greater knowledge of God and Christ: who They are, what They are like, and what They expect of me. As I’ve acted on Their teachings and put them into personal practice, I have felt Their love and peace in my life. To read more of Randall’s articles, click here. I have seen firsthand the blessings that come from taking the time to serve others—having peace bind up my broken heart and having my own concealed wounds healed (See A Poor Wayfaring Man of Grief, verse 5) as I’ve forgotten myself and followed the Savior’s example of going about doing good. I know the things I have written are true. I also know that you can come to know these things for yourself if you will make the effort. May the Lord bless you in all your endeavors to draw near unto Him! Randall McNeely is a husband, father of five, and author. He is also a singer/songwriter and has written several patriotic songs, children’s songs, and multiple religious hymns. The best known is 'Oh Jesus, Savior of Mankind', which won a Special Recognition award in The Church of Jesus Christ of Latter-Day Saints 2008 Music Submission contest. He and two of his daughters have also recorded and released the children’s song Everybody Speaks Smile! Randy has a firm testimony of Jesus Christ. He is the light and the life of the world. It is said and written of Him that "He went about doing good." In doing so, He weaved light into the hearts and souls of all with whom He came in contact, both in word and deed. Randy's desire is to have the same said of him. He wants to have the words and lyrics he writes uplift, inspire, and bless others. To read more articles by Randy visit his Pure Testimony website at www.puretestimony.org.